This sealant preserves the woods natural look while providing an unprecedented shield against nature. Log Home Shield will reduce the expansion and contraction cycle due to moisture changes within the wood, which will extend the strength of the wood. Its use eliminates or greatly reduces nail staining, water marking, warping and cracking. Beauty, durability and clear protection are combined in this unique finish that contains no hazardous materials, is not poisonous and will not burn. Protects all types of commercial grade wood. Log Home Shield is recommended on exterior bare wood, pressure treated wood, or wood recently stained. Not recommended for painted wood surfaces. Use on log homes, fences, siding and garage doors. Do not use where traffic will be present, ie: on deck walking surfaces or the seat area of furniture. A heavy coat is recommended. Coverage will vary due to porosity of surface and application technique. One gallon (3.78 Liters) will normally cover 150 to 250 sq. ft. (13.9 to 23 sq. meters) on highly porous surfaces and 200 to 300 sq. ft. (18.6 to 27.9 sq. meters) on less porous wood surfaces. Do not thin. Clean surfaces thoroughly. Remove all dirt, sap and mildew. Check for rot and decay. Replace any damaged boards with new wood. Caulk all cracks around joints, seams or other sources of moisture entry. Clean discolored wood thoroughly with Interlock Wood Cleaner, using safety precautions to protect skin and eyes. Rinse well and let dry. Power washing is an excellent way to clean large surfaces quickly. Surfaces should be treated with a fungicide to prevent fungal/mold/mildew growth. Clean surface thoroughly. Remove all traces of previously applied stain or paint by scraping or sanding. Old colors, stains or marks will show through this transparent finish. 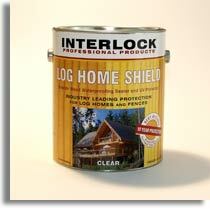 Log Home Shield provides superior long term protection for stained surfaces. Applying Log Home Shield as an overcoat to your stained wood will significantly reduce maintenance, enhance and stabilize the color. For best results, allow 4 to 6 weeks of weathering to stain before over-coating with sealant. If wood is grayed and deteriorated, the surface should be lightly sanded to reveal a clean layer of bright wood. Deep cracks in the wood must be patched. Severely eroded wood should be completely removed. Mildew is a fungus that looks like dirt but won�t wash off. Mildew must be removed before finishing or it will grow through any new coat of finish. To remove mildew, scrub surface with Interlock Mildew Remover. Rinse thoroughly. Protect eyes and skin by wearing rubber gloves and eye goggles when working with Interlock Mildew Remover. Allow to dry completely before applying finish. Areas with little or no direct sunlight may grow mildew. To prevent future mildew growth, pre-treat these areas with a fungicide. Surfaces should be treated with a fungicide to prevent fungal/mold/mildew growth. Do not thin or intermix with other coating products. Application with a high quality brush is recommended. May be applied by roller, dipping or by lowpressure garden-type sprayer. If applied by sprayer to rough surfaces, backbrushing or back-rolling is recommended. Coat vertical surfaces starting at the bottom and working up. Do not saturate or puddle on horizontal surfaces. Application Note: A heavy coat is recommended. Apply a second coat as needed. It is recommended that you test a small area to assure satisfaction of appearance. Allow 24 to 48 hours depending on temperature and humidity. Over application will lead to increased drying time. Apply only when surface and air temperatures are between 45-90�F (5-37�C) during application and curing time. It is not Recommended to apply product if rain is expect within 24 hour period. Clean brushes and equipment immediately with warm soap and water.